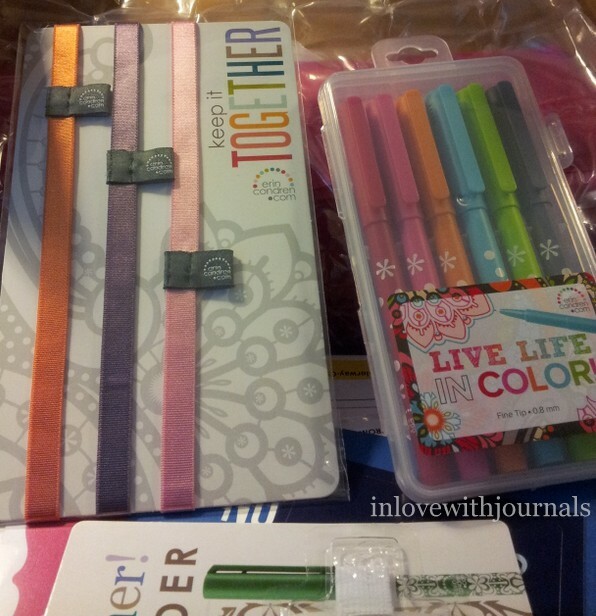 A co-worker of mine purchased one of the Erin Condren Lifeplanners and as I’ve said previously, I was tempted. Boy was I tempted. 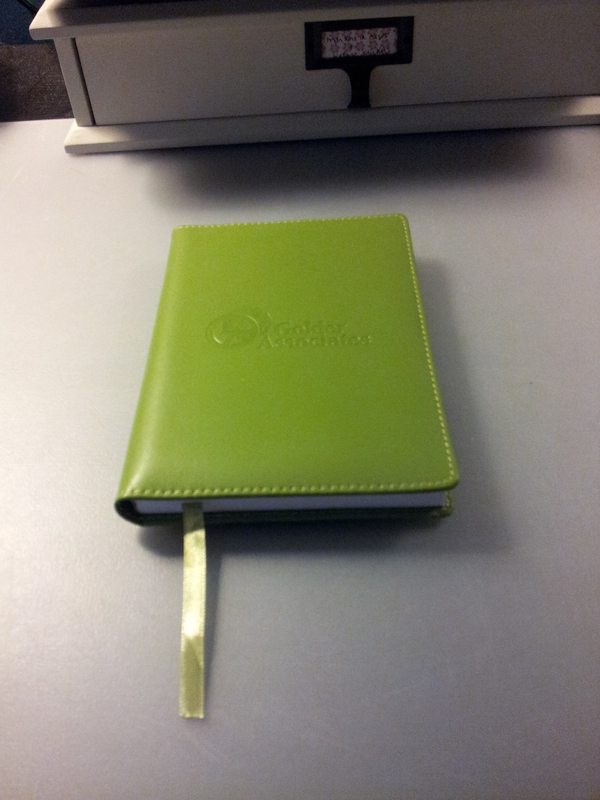 But I bought two basic notebooks instead, and a few accessories, and they arrived this week. I think it took about 10 working days from order to delivery. 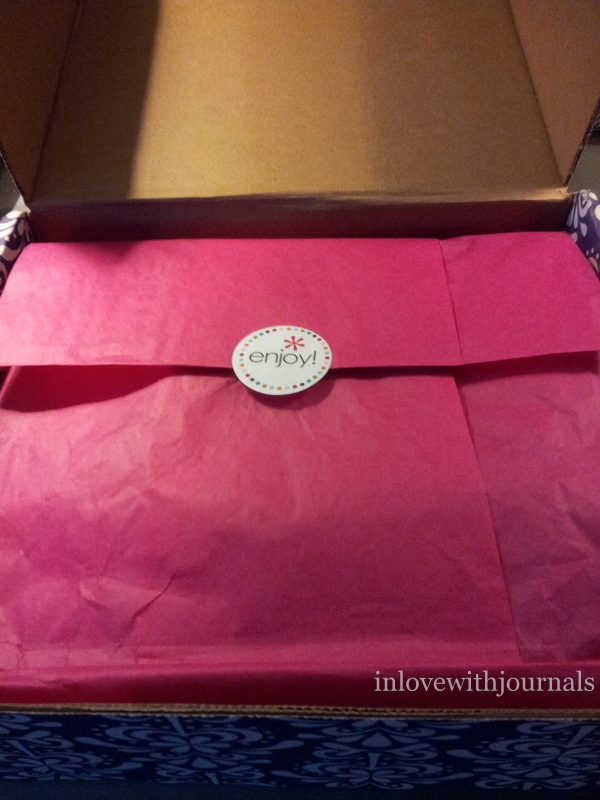 Personalized items take more time but they do have a number of attractive options that are ready to ship. The packaging is exceptional; very bright and cheerful. 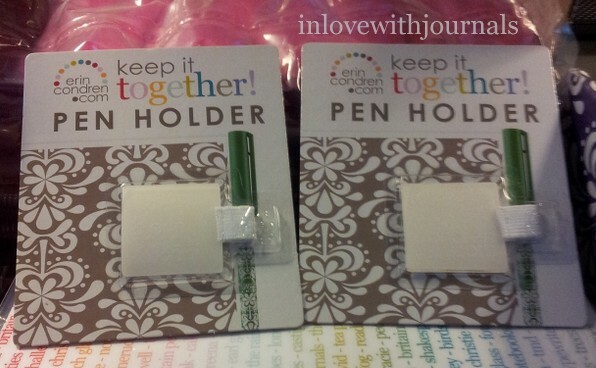 On the left, some elastic bands for keeping the notebooks closed. On the right, Party Pops Markers. Really nice pens with extra-fine tips. And I’m a sucker for pens in their own case. Sigh. 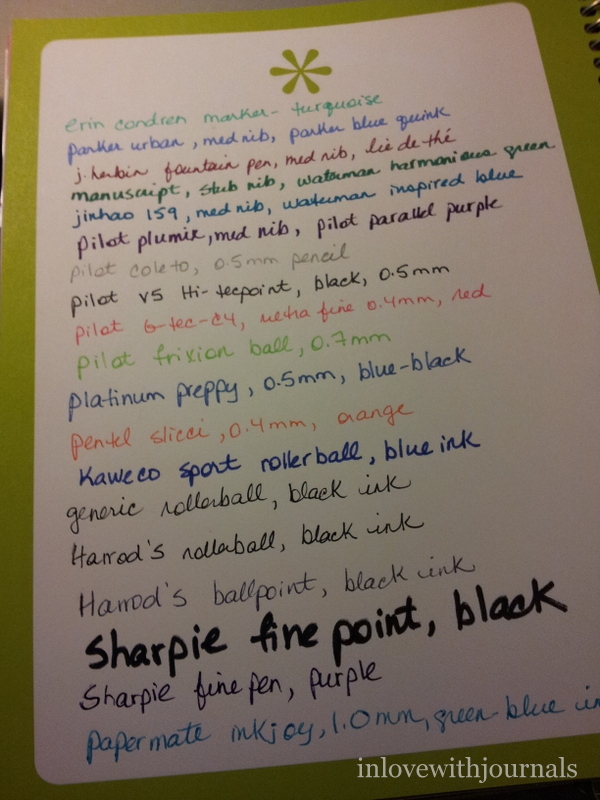 Like I need more markers! These are the freebies that come with each order. 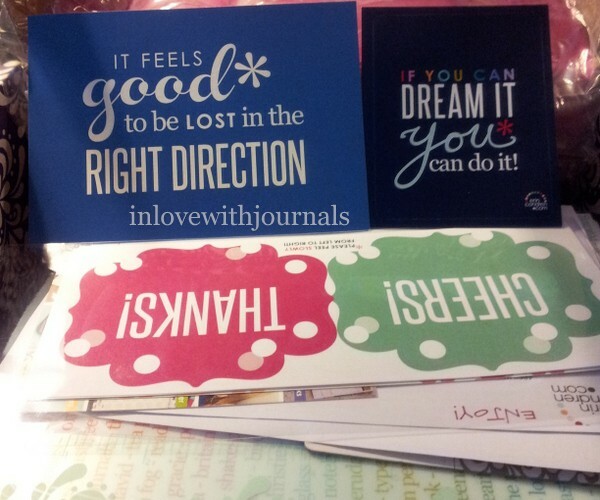 On the left, a postcard, and on the right, a sticker for your notebook. 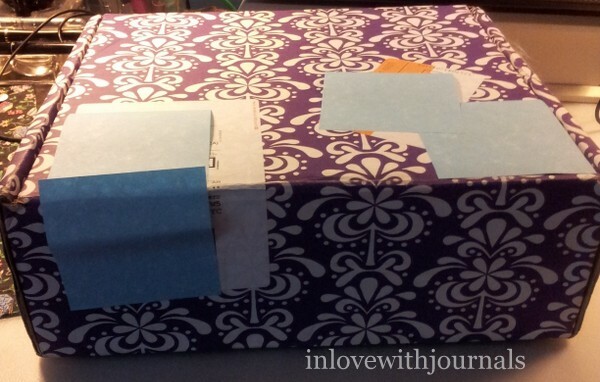 And on the bottom, a package of gift tags. I included a couple of pen holders in the order. This is one of the cover designs that is available for the planner as well as the notebook. This is the Alphabet – Keep It Simple design. You choose the letter and the colour of the large letter as shown here. The covers are laminated. And the bookmark is thick plastic; very sturdy feeling. 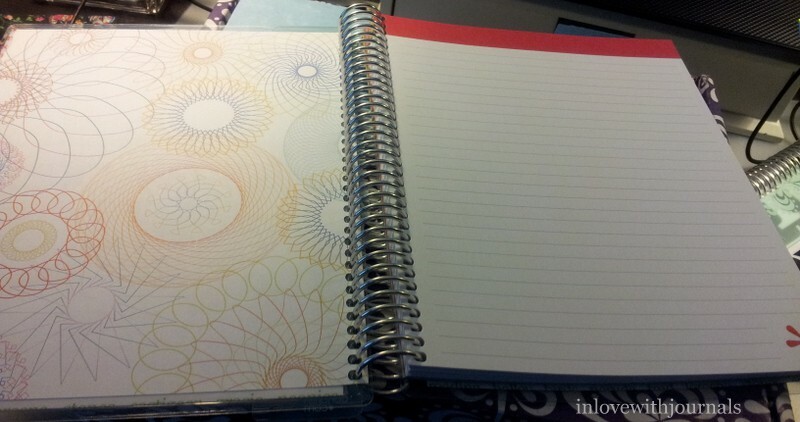 Both notebooks measure 7″ x 9″ but they are available in 8.5″ x 11″ as well, for $5 extra. And here’s the second design I chose, again available for the planner as well. It is called Favorite Things – Keep it Simple. I think this is my favourite of the two covers because it’s so much more personal than just a name or an initial – it’s literally everything I love! 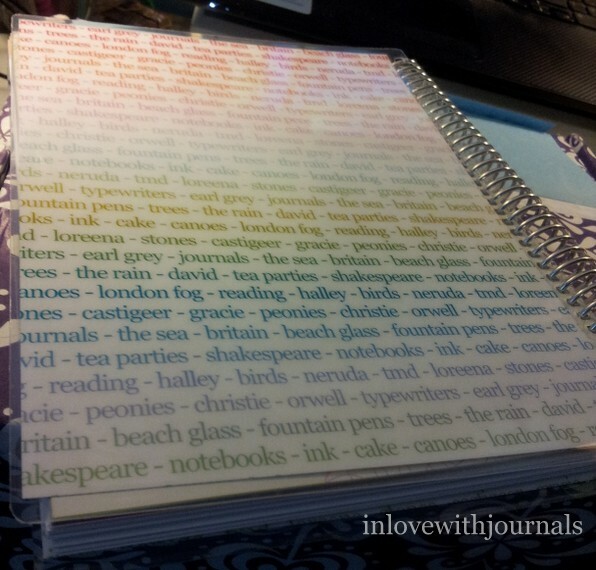 You can personalize this by typing in all of the words you want to see on the cover. You can also add photos, or change the font. 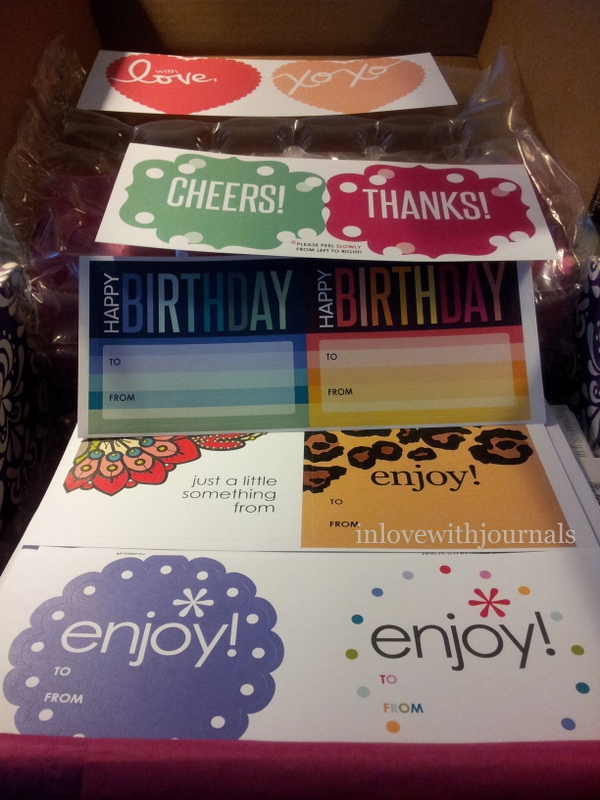 Erin Condren really allows for a high level of customization. The cover design is carried over to the inside. 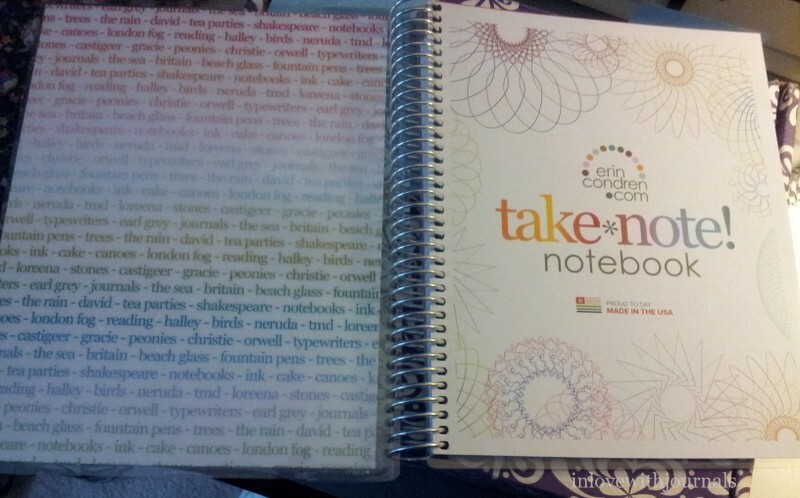 I love the designs on the take note! page – anybody remember Spirograph?? I had one as a child and loved it. It’s nice to know they are still available on Amazon. More spirographs! I might colour them in for fun. And the notebook pages begin. The paper is very good. The weight is 70lb and you can certainly tell. A pen test is included further down. 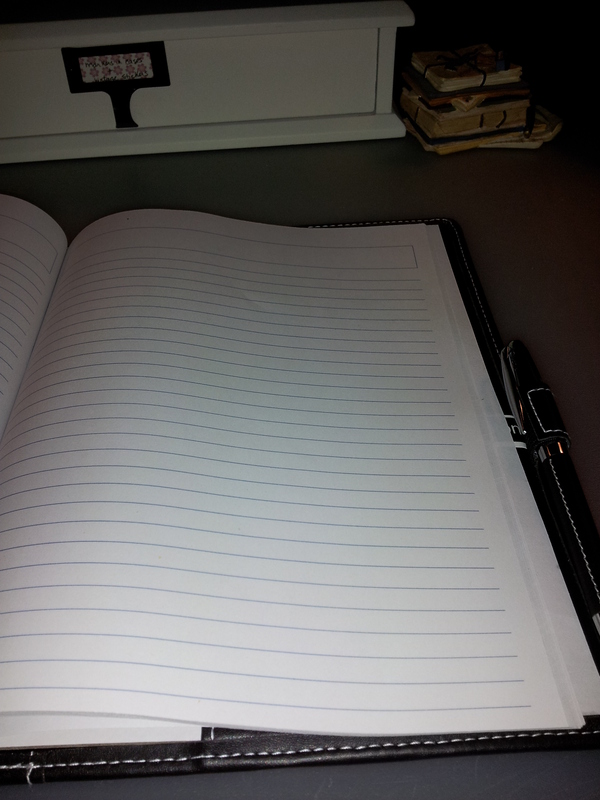 There are 132 lined pages, each a different colour, followed by 21 blank pages. Such an inspiring design. I am a lover of colour so the pages really appeal to me. 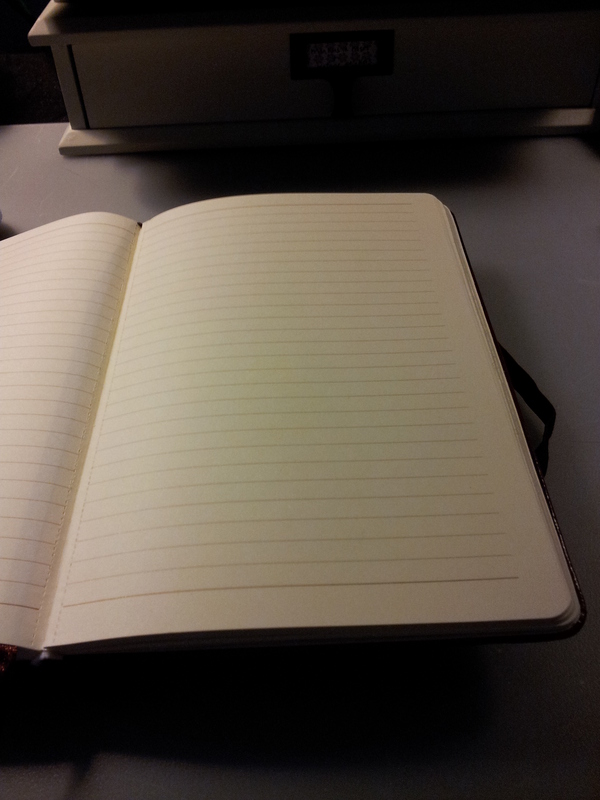 This is the last page of both notebooks. I laughed out loud when I saw this because this is one of my favourite quotes. 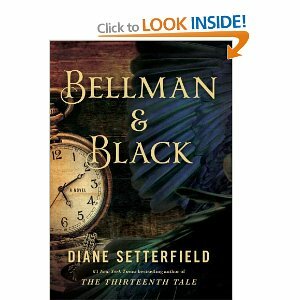 The back cover of this design carries on the favourite things theme. 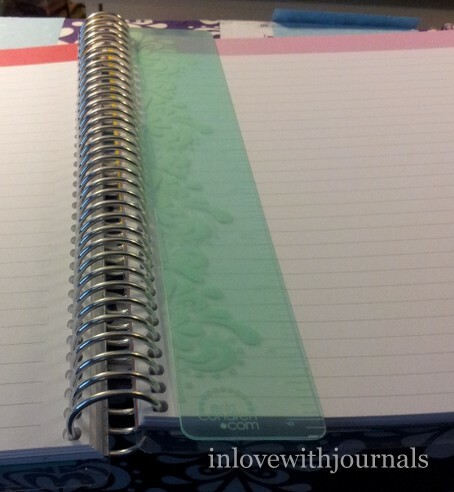 The bookmark is included with each notebook. It is thick – thicker than a credit card – and snaps into the rings very easily. It’s a nice touch. You can also purchase dividers and undated calendar pages. So many options. 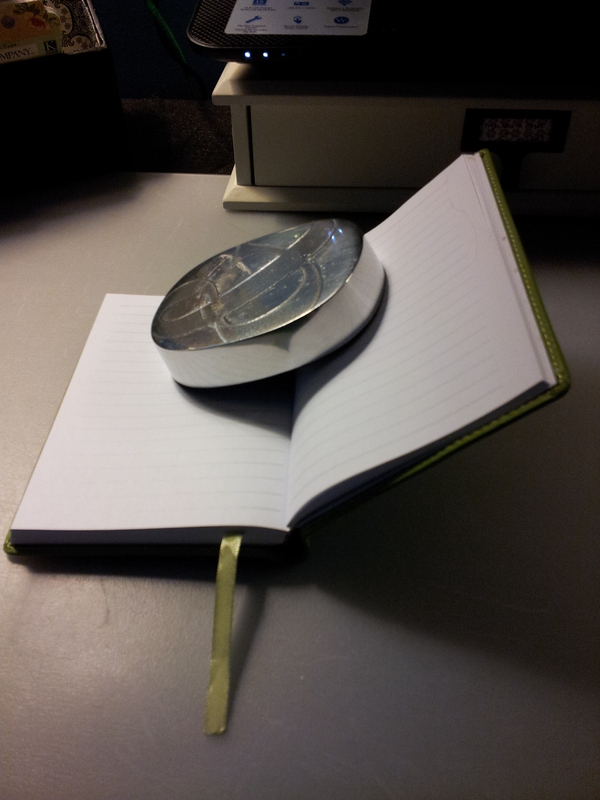 The pen loops are super sticky – just as good as the Leuchttum 1917 ones. And the loops themselves are stretchy – I didn’t try my Jinhao 159 but the Parker Urban had no problems. And of course the Party Pop Marker fits perfectly. 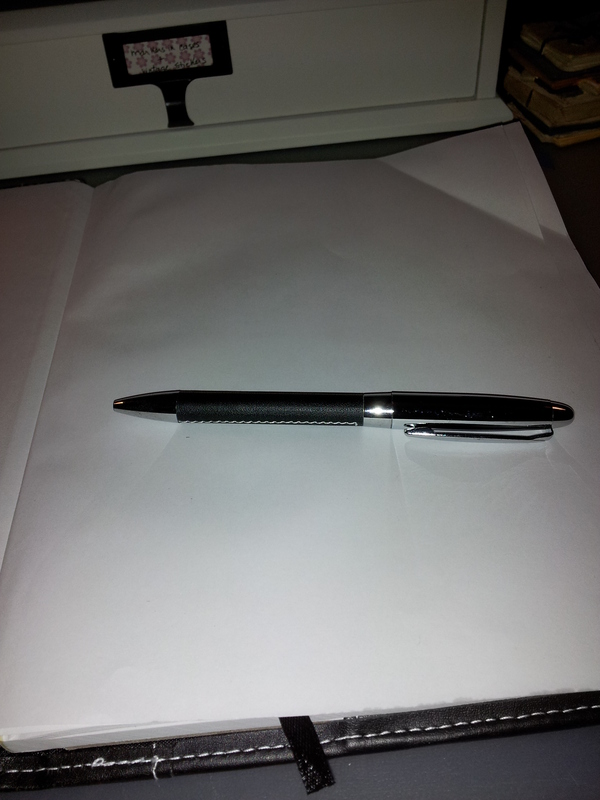 And here is the pen test. I didn’t like the feel of the rollerball and ballpoint pens on this paper, and I was very happy to note it took fountain pen ink like a dream. Slight bleed through (those Sharpie markers) and some show through, but nothing to worry about. Fountain pen friendly! 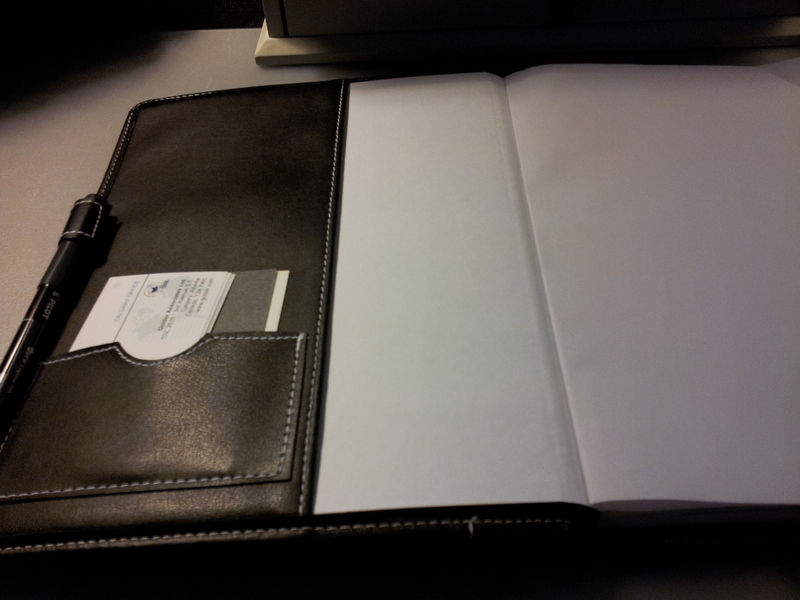 Overall I am very impressed with the quality of these notebooks, and the customization options are numerous. There are more accessories and lots more cover styles available so check out the website. I was also emailed a $10 off coupon for my next order. I don’t know when that will be, as the exchange is brutal right now and shipping is a flat fee of $20 to Canada. 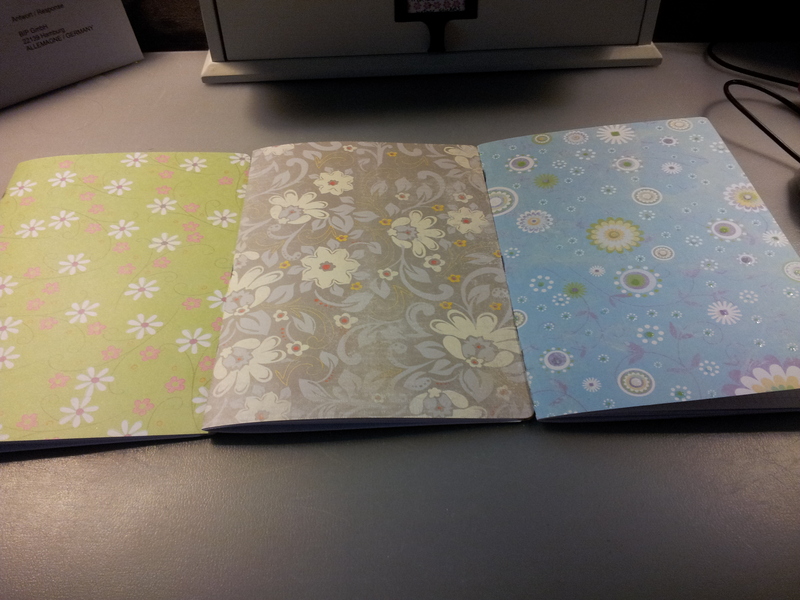 Each of these notebooks cost $22 due to the personalization. Worth it, in my opinion, but still pricey. You get the quality you pay for. I work for Golder Associates Ltd. We are a “global, employee-owned organisation providing independent consulting, design and construction services in our specialist areas of earth, environment and energy.” My current role is a Technical Editor for a dedicated client team. I’ve been with them for five years. 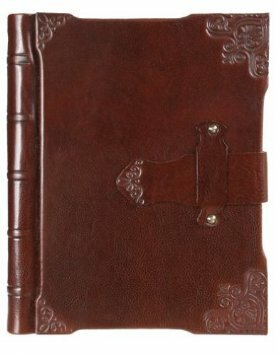 In those five years I’ve received five journals and today I wanted to share them with you. 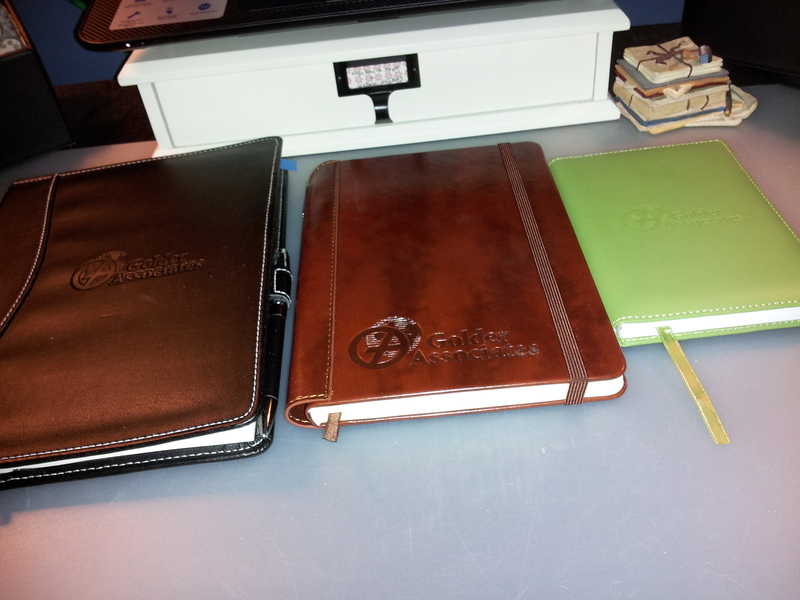 I have received five journals in total: two of the large leather refillable journal on the right, one of the brown journal, and two of the small green journal. 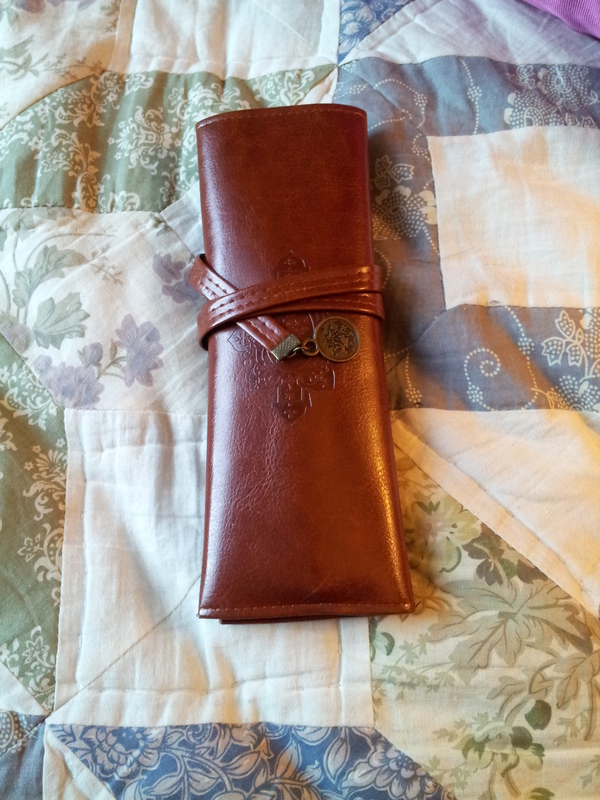 Inside the leather refillable. I use this at work all the time, so it has my business cards in the pocket and one of my pens. This is the pen that came with the journal. Notice it has the same sewn detail as the pen. 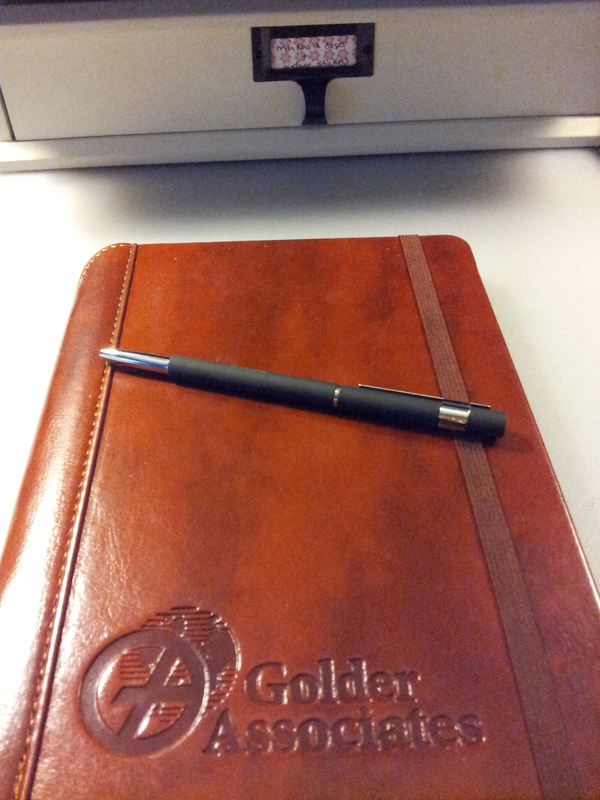 I like the look of the pen but it does not stay released when I try to write with it. I turn the barrel until the pen appears but then when I start to write the point goes back into the pen. Most annoying. But that’s a ballpoint for you! The paper is pretty thin but it ‘s not bad. 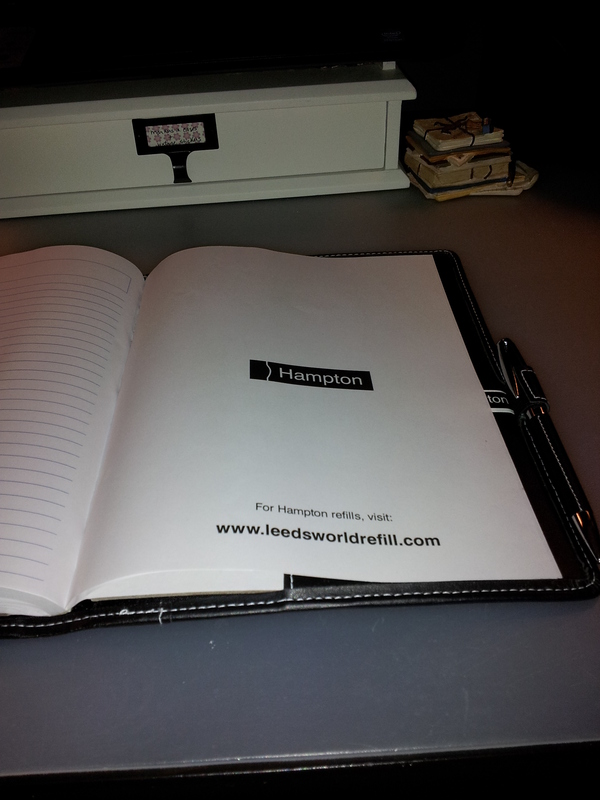 So the journal is made by Hampton, and it’s nice of them to list where to find the refills. Sorry for the blurriness; on my phone it looked fine. This journal I received this year. 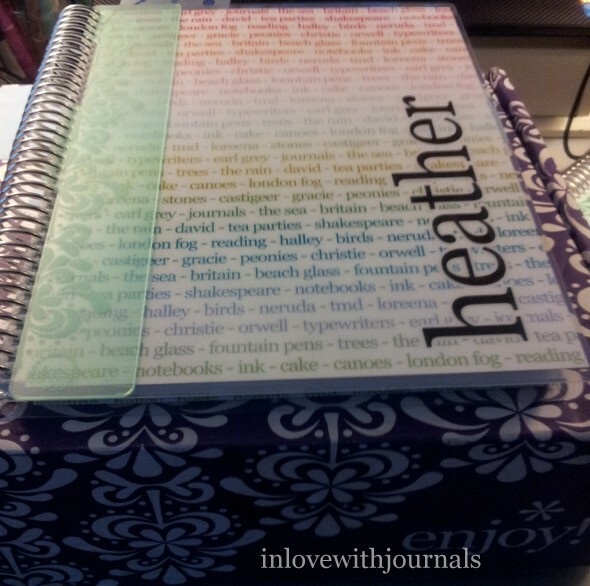 I love the color, and the fact that you can stick a pen in the binding. A close-up of the pen that came with the journal. 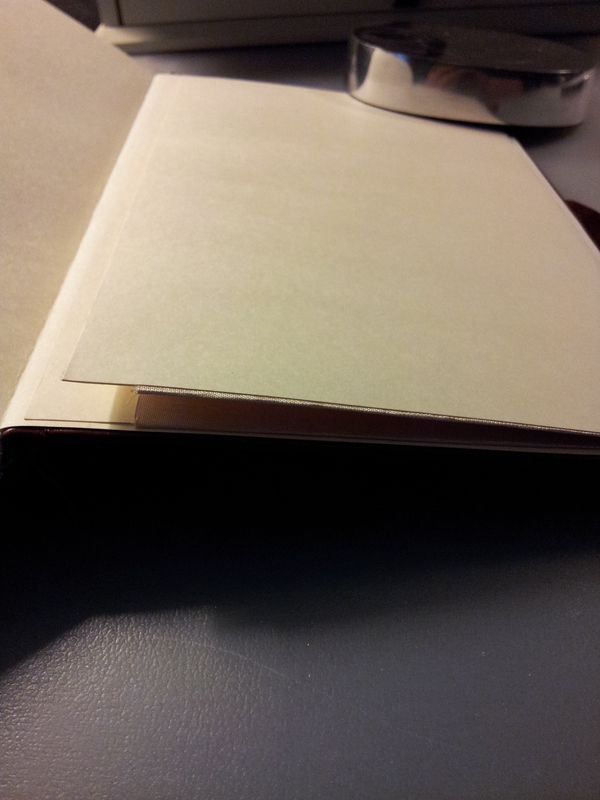 And this is where the pen lives in the binding. 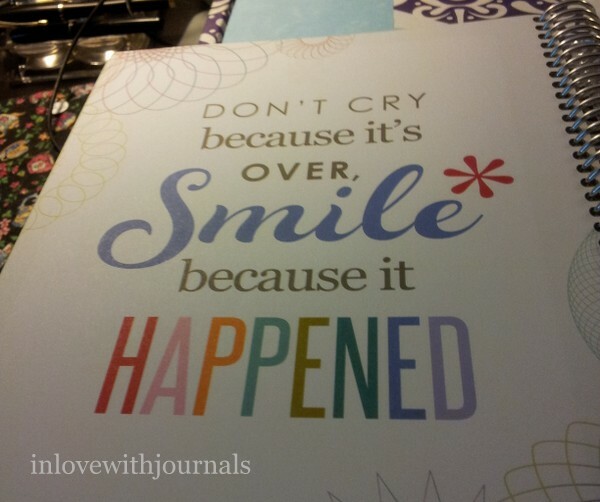 Just like my Cross Journal. 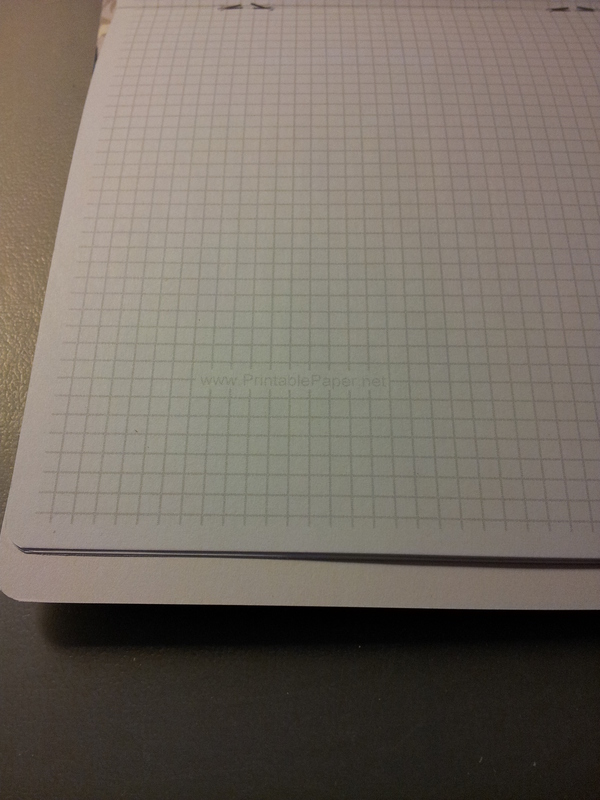 Nice ruled pages with brown lines – and they are perforated which is a nice detail. I wish it was refillable though. Back cover. Another one made in China, by Spector and Co. 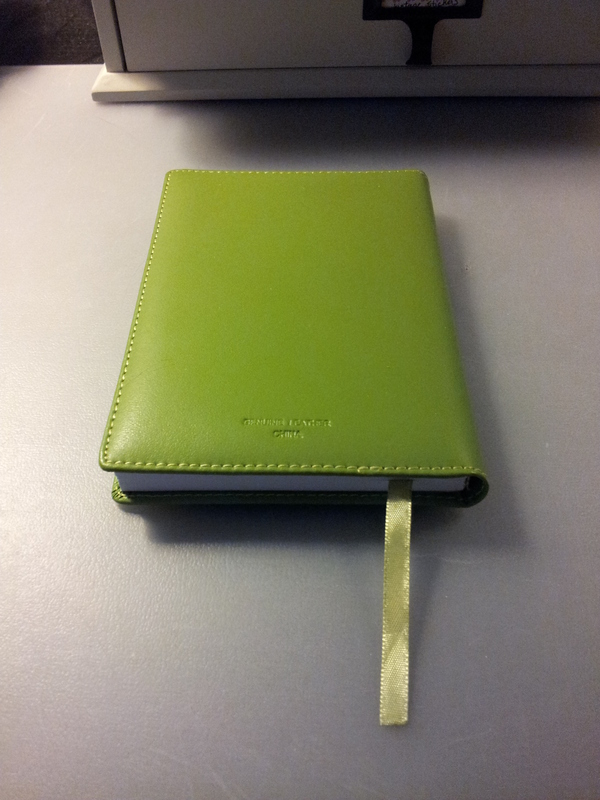 This is the small green journal. 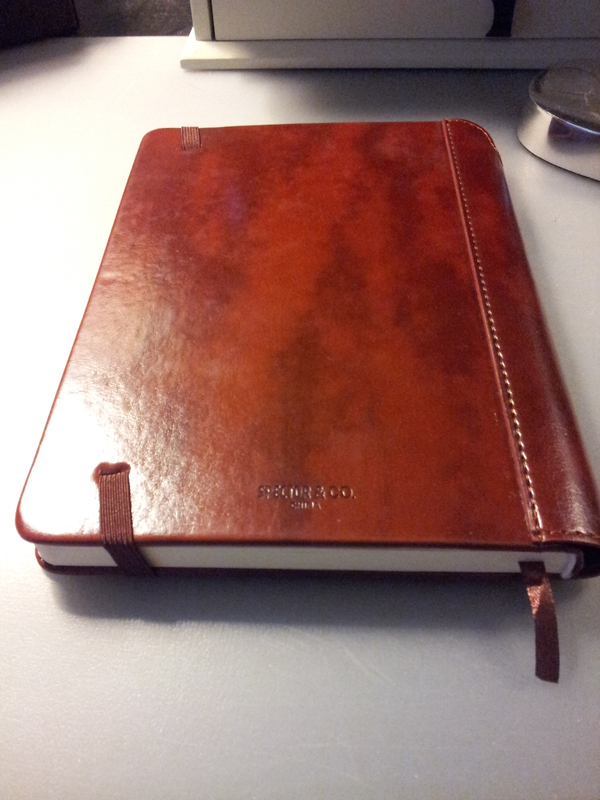 Love the color but not crazy about the journal itself. 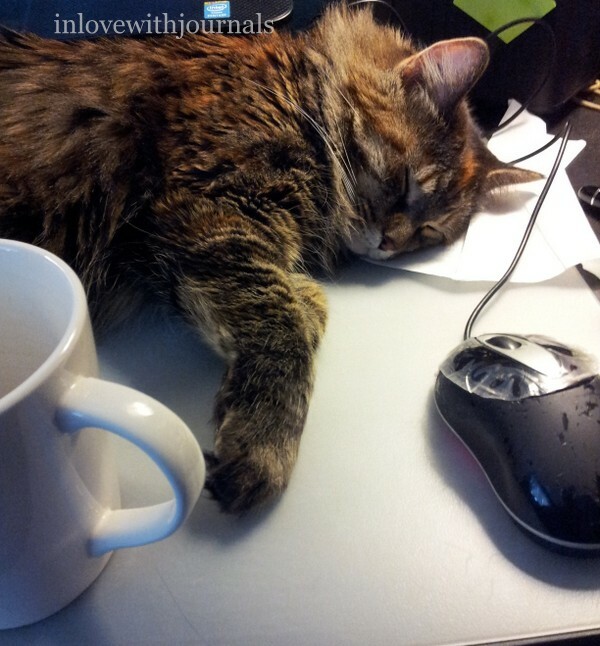 It doesn’t lie flat at all. Very disappointing. Genuine Leather and again made in China. So there you have it. 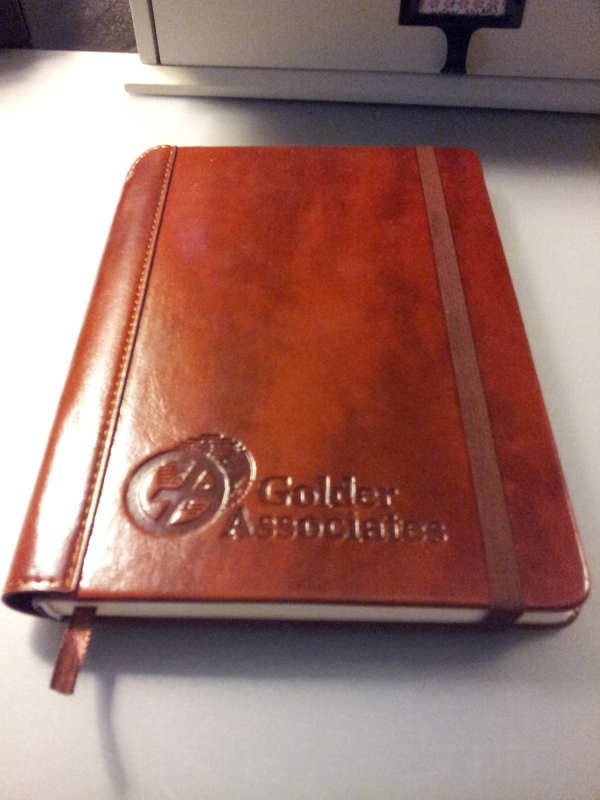 Golder is very good to give out these journals and other gifts; I really do appreciate them. It’s nice to be thanked for your efforts. I’ve been seeing lots of videos and blog posts about what people carry with them every day. So I thought I would do one too. It’s about what I carry with me every day, an update on my planner, and kind of a “what’s in my bag” post as well. Some of these things I’ve talked about in previous blog posts, some stuff will be new. 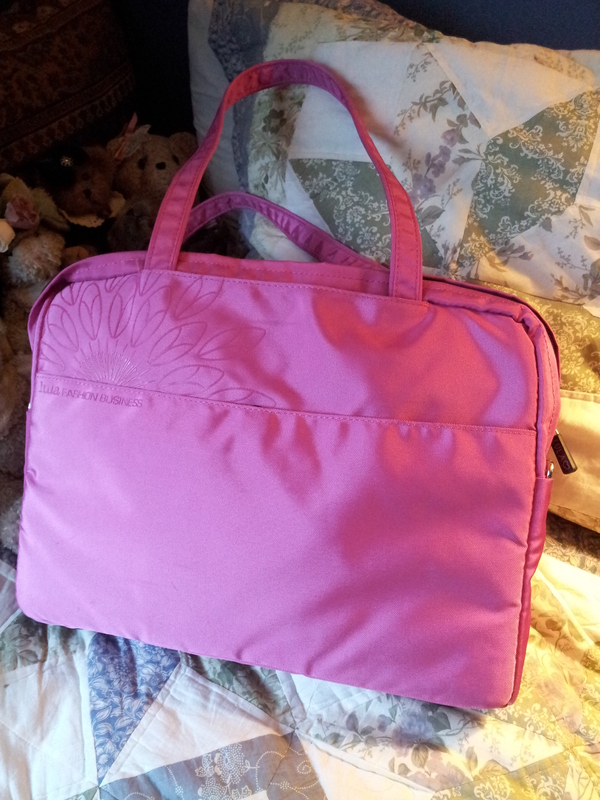 This is my Lula Fashion Business laptop bag. 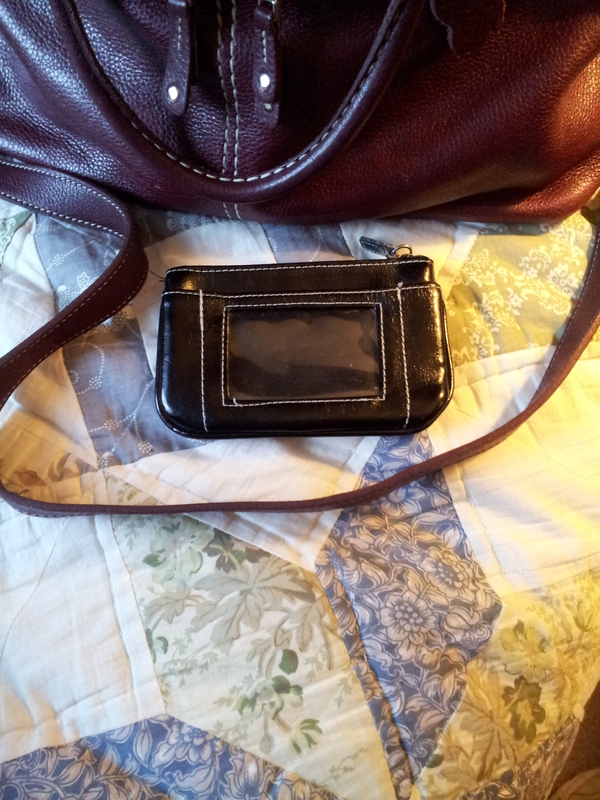 When it doesn’t hold my work laptop it holds what my purse doesn’t. I carry my Cadence pens with me. 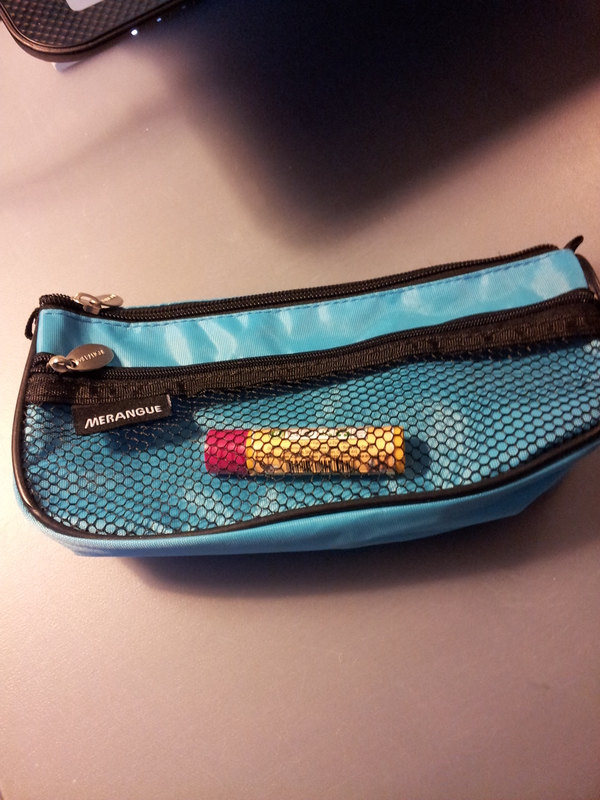 This pencil case carries lip balm and my phone charger…but no pencils! 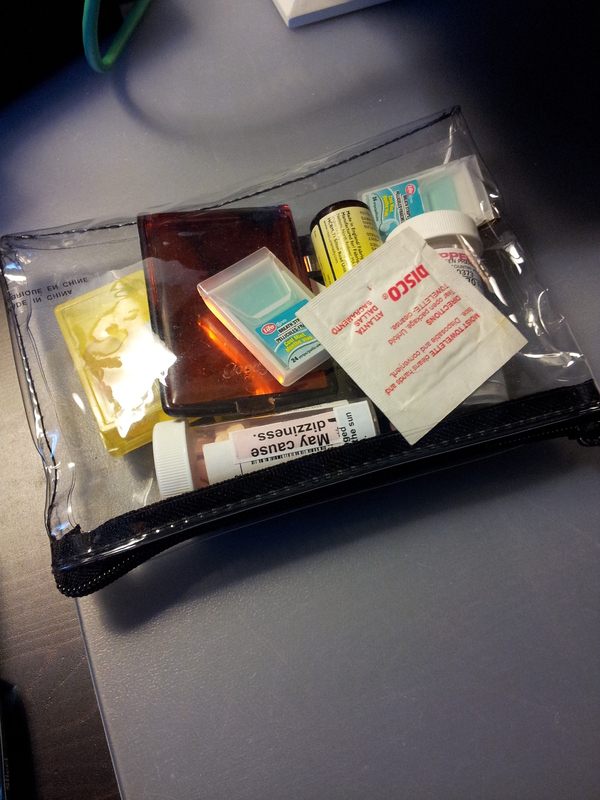 My medicine bag, which contains medication, wet wipes, a hand mirror and breath freshener. 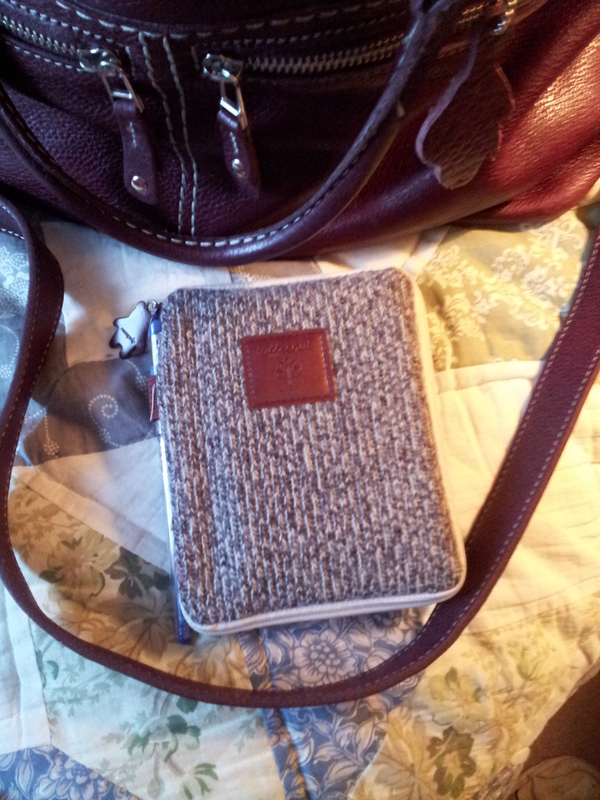 I carry my journal with me everywhere I go. 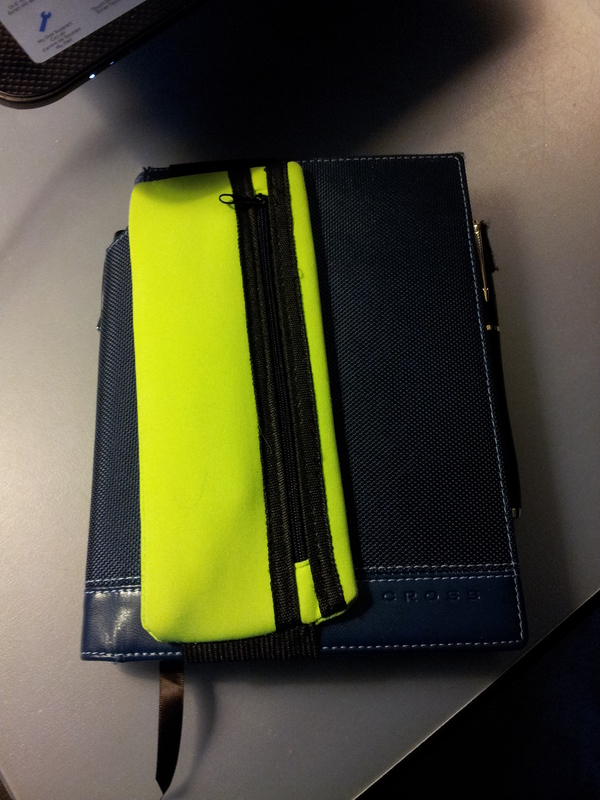 The yellow pencil case is attached to the cover of the journal by a large elastic. I found it at a dollar store, believe it or not, and it works beautifully. A few more of my favorite fountain pens live in here. The Monteverde Prima and my Parker Urban are in the pen loops. 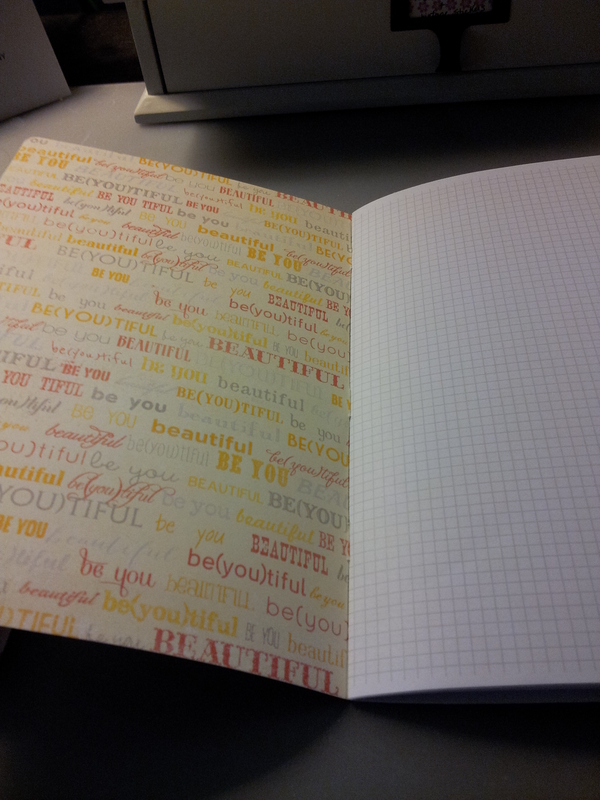 And here is my planner! We are still together! 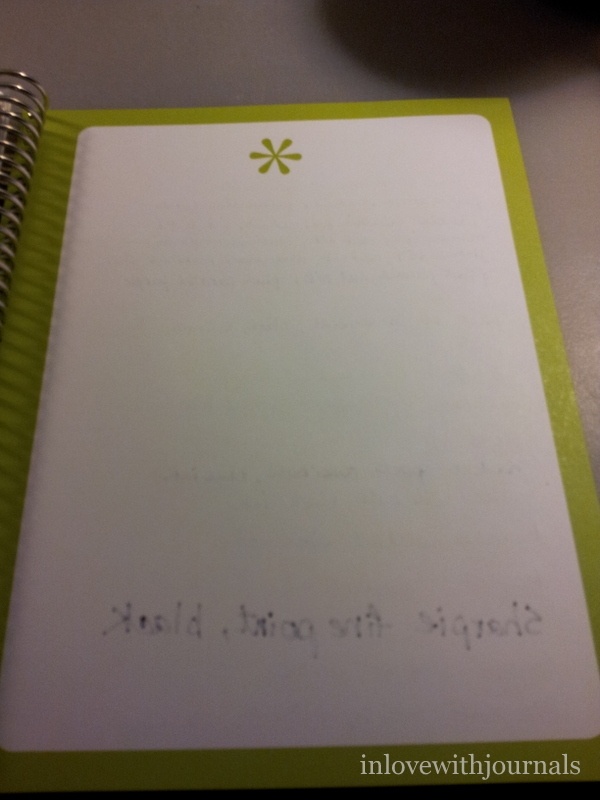 You recall I first started using this planner on December 1 of last year. I wanted to use this planner for all of 2014; I didn’t think I would make it this far. I must admit I’ve been feeling the “planner itch” as I’ve heard some call it; I’ve been reading about the Hobonichi Planners at Plannerisms and I feel tempted. 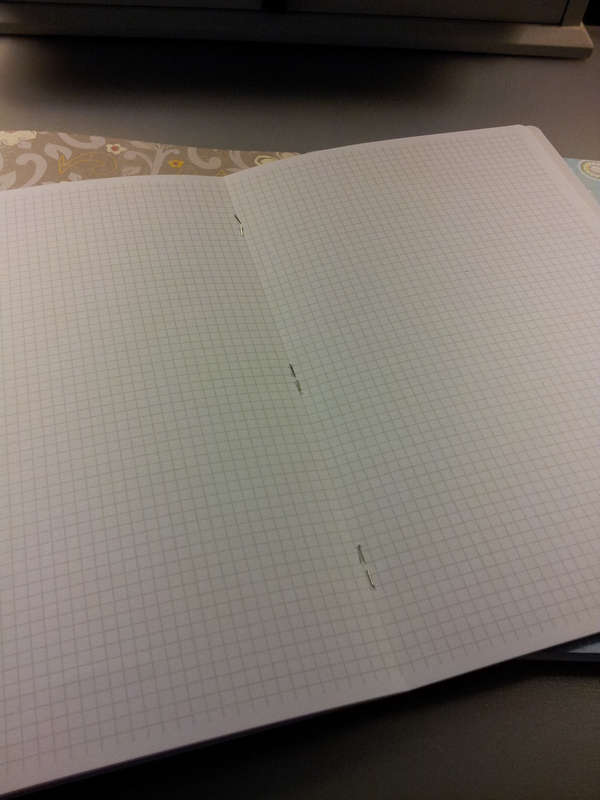 One of my InCoWriMo penpals sent me some Tomoe River paper, which is the paper in the Hobonichi Planners, and it is wonderful. But I am going to stick with my Martha Stewart disc-bound system. It’s been working great since December so why change? So that’s it for my laptop bag. I also carry my purse every day so I thought I would include that too. 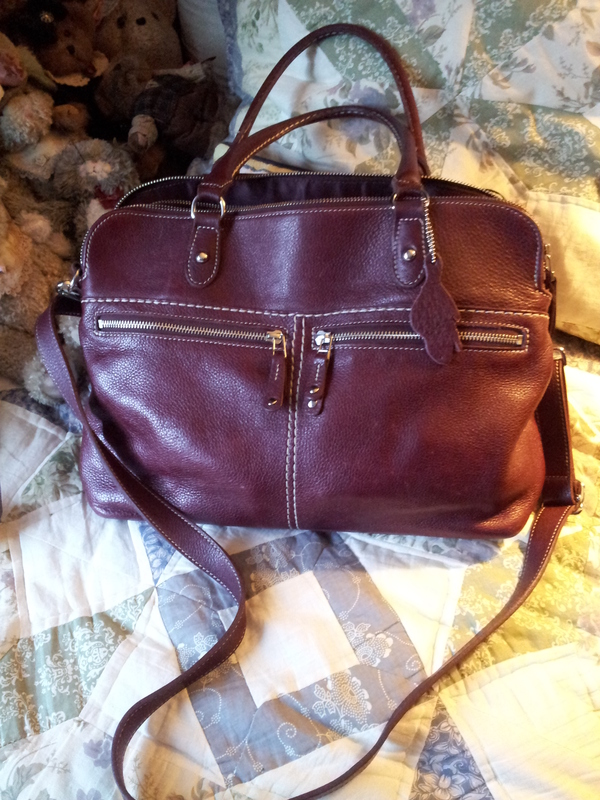 My current bag is the Roots Londoner. It is my second leather Roots bag and I really love it. It’s very roomy but if I try to put everything from my laptop bag into this bag it stretches the leather and is too heavy for my shoulder. So I split the weight up between the two. 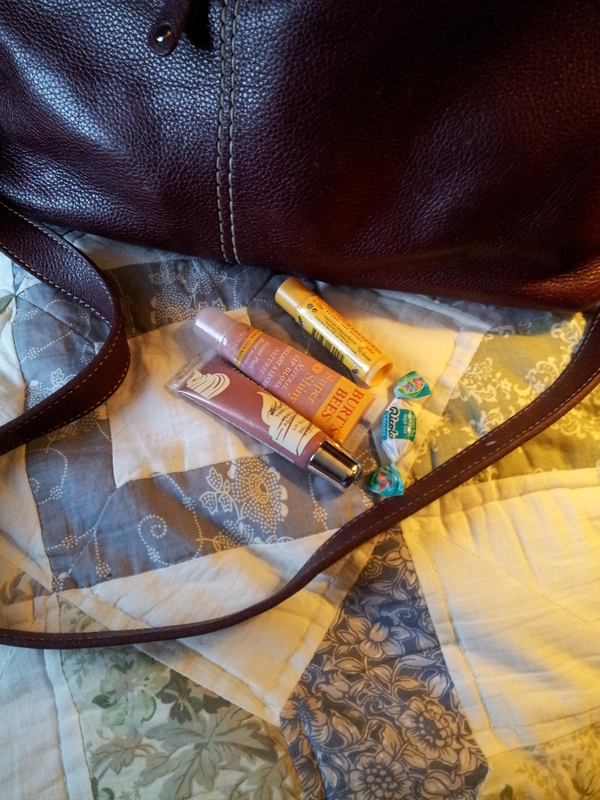 In the zippered pockets on the front I keep lip gloss and Green Tea and Echinacea Ricola. 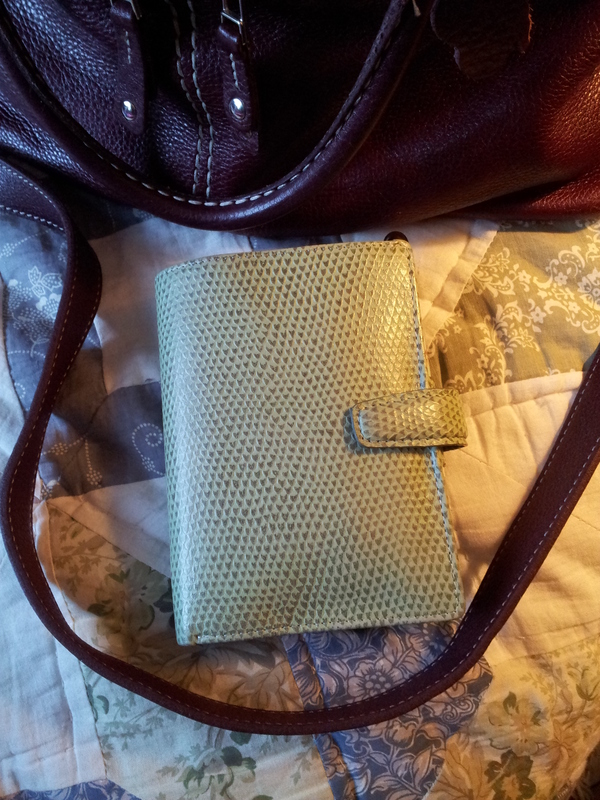 My Filofax wallet is a green chameleon. I found it at my local Reid’s Stationers on sale. 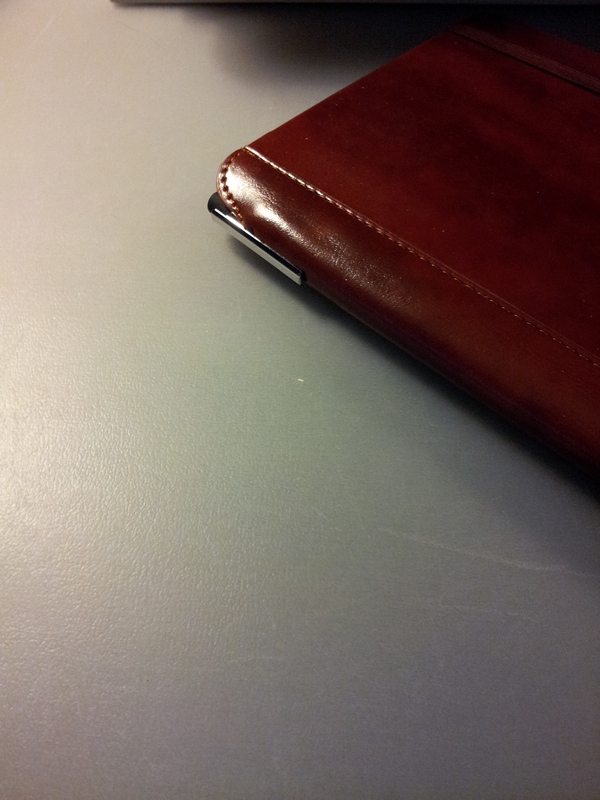 I can see why lots of people use it as a wallet; I’ve been using it without incident for over a year. 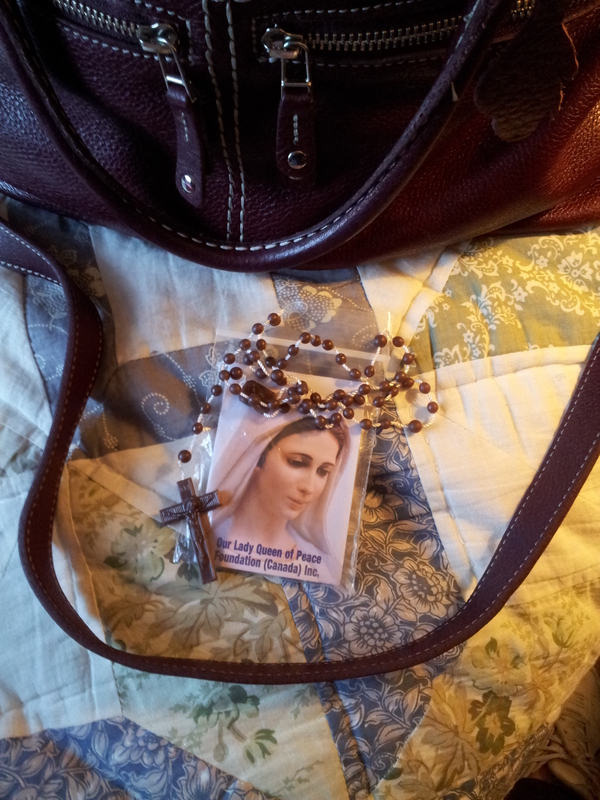 For as long as I can remember I’ve carried a Rosary in my purse. This one I picked up at our local church. Remember my Toffeenut Planner? 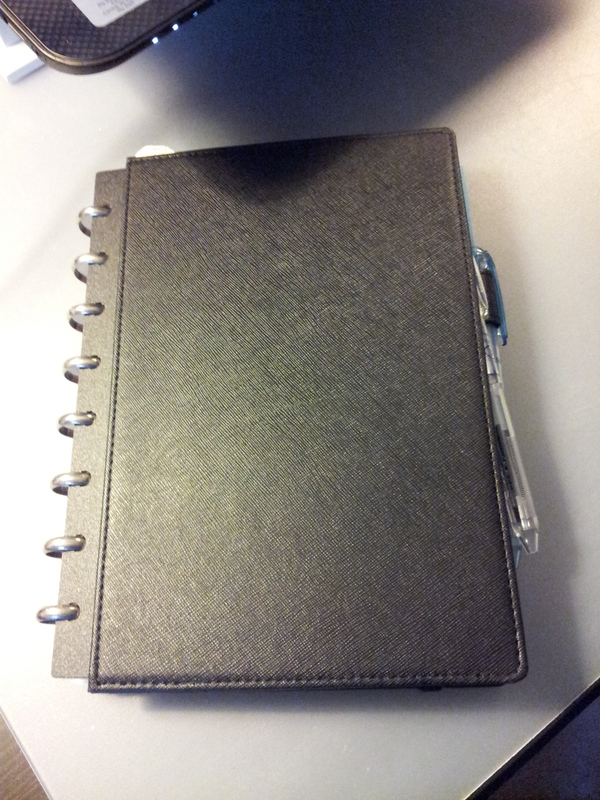 I didn’t actually end up using the planner but I do still have the case. I found small notebooks that fit it perfectly so I carry it around with me just in case I need to make some notes that wouldn’t normally go in my Cross journal (like directions or my grocery list). 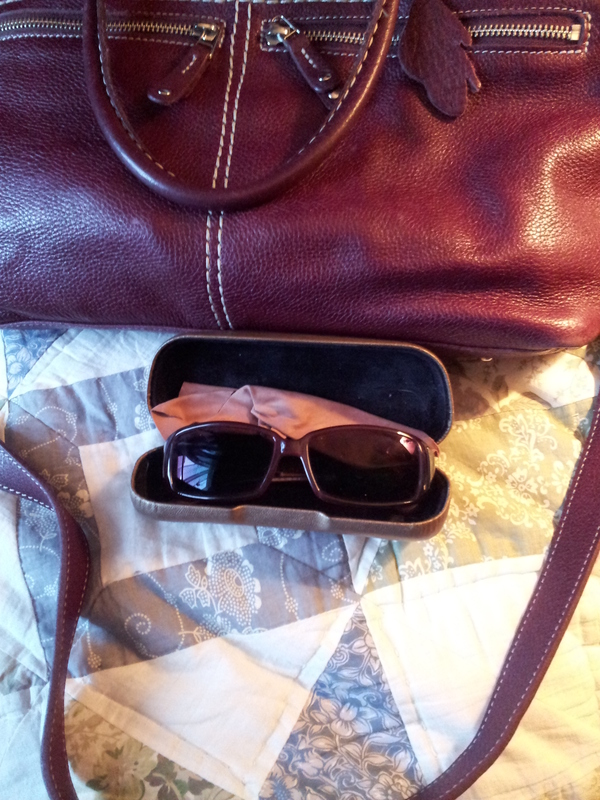 And finally my sunglasses, which I’m realizing kinda match the color of my bag. And that’s it! I hope this wasn’t too terribly boring. 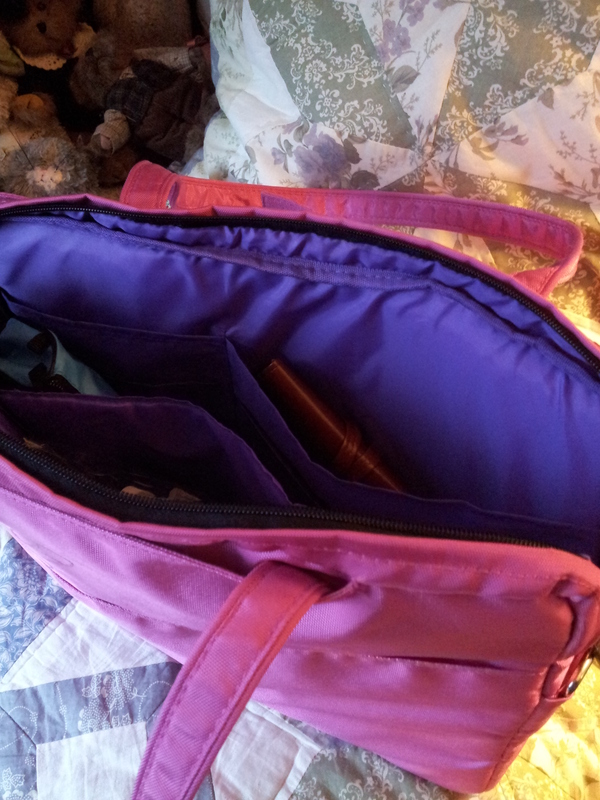 I’m always interested in other people’s bags and what they carry every day. Would love to see what you carry! Great post on dispatchfromla.com about re-reading past journals. I look back at mine on occasion, and I’ve been known to remove pages. But for the most part I leave them intact. I write what I need to write and if anyone reads them down the road they will know me and hopefully love me and understand. There are a lot of ways to be truthful and not all of them involve gut wrenching psychological poop storms. The author makes a great point about looking in a mirror of sorts and seeing yourself through your own eyes, at 20, at 30, at 40. You can learn so much about yourself, how you handle things, what positive things you do, and how you sabotage yourself. You may see patterns emerging, which you can work on, depending on if you want to change the pattern or encourage it. Or you can write your truth and set it free, never looking at it again. So whether you have a complete set of journals from age six onwards, or you have one book that will be destroyed as soon as you finish it, I hope you enjoy the process and are richer for it. Happy writing. My sister was in town this week and we met up today to have tea and talk notebooks and pens, and various sisterly things. Big sis spoiled me rotten, arriving with bags of food. She baked the yummy scones and provided the cheese and crackers and chocolate (and vegetables and fruit not shown here). 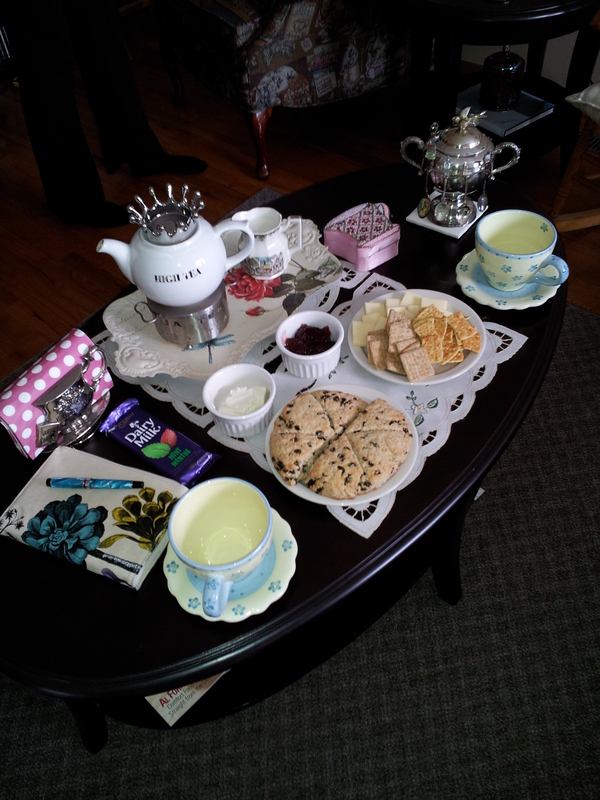 I provided the tea and tea things, strawberry jam and Devonshire cream. It’s hard to see but one of my Phasha journals is sitting on the table to the right. My turquoise Monteverde Prima is sitting on top of it. 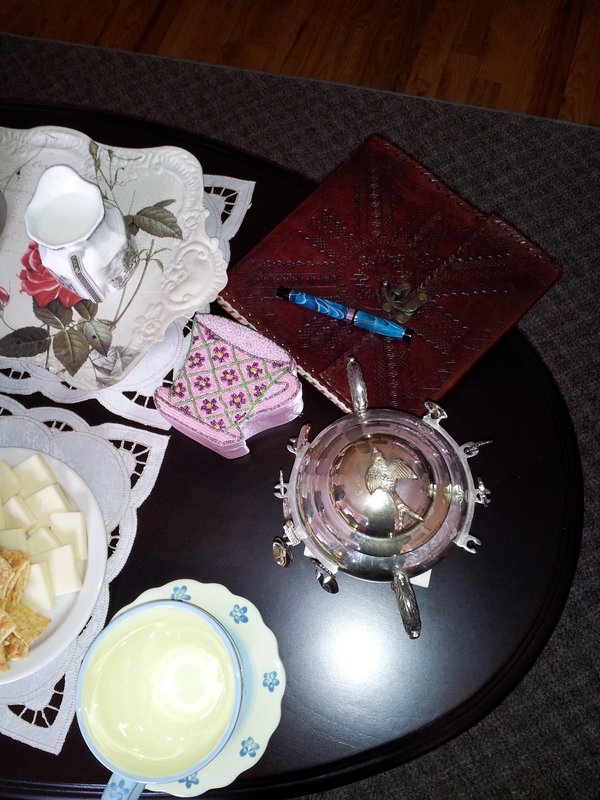 Here’s a closeup of the journal and some tea things. 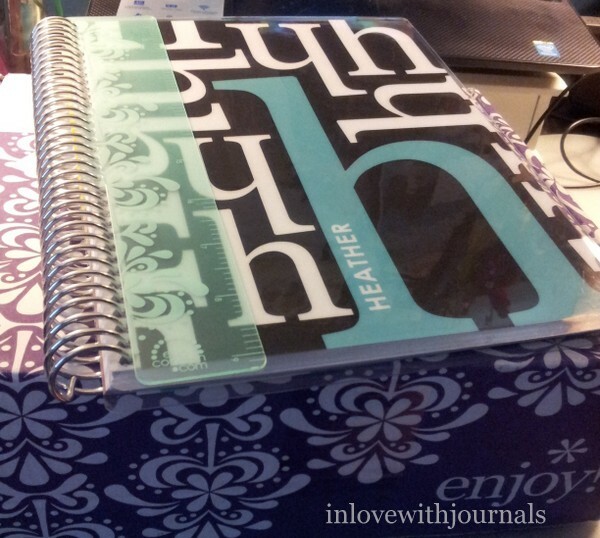 We also invited my Thomas Paul Botanical Slipcover Journal to join us. 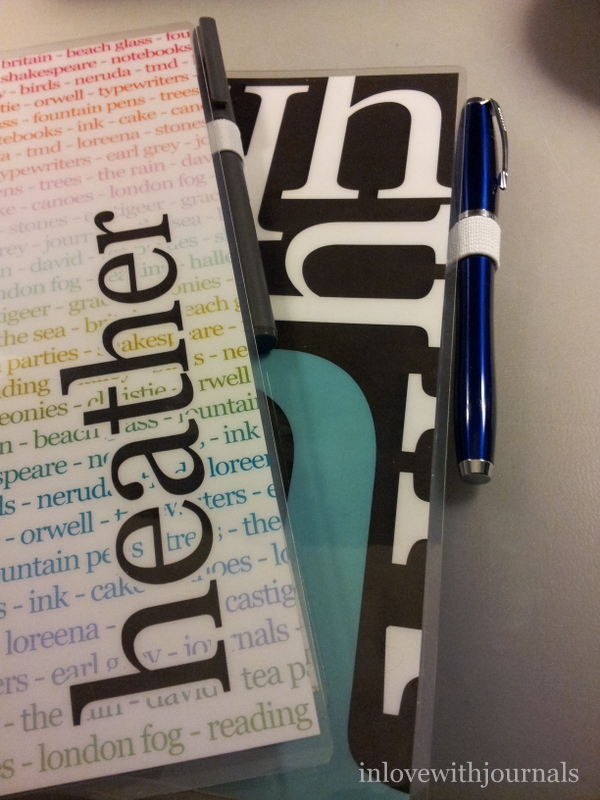 My Monteverde Prima looks very fetching with it, no? 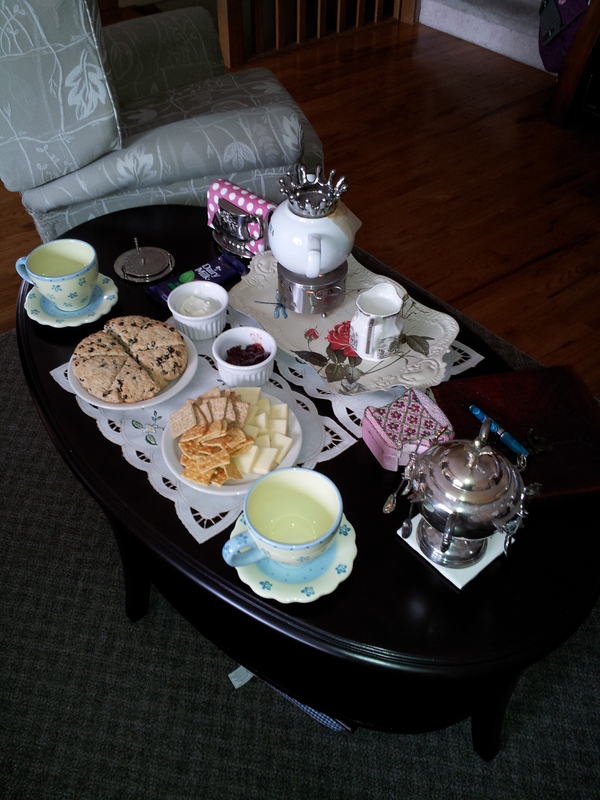 We devoured the food and filled the tea pot twice. We chatted and laughed and admired each other’s fountain pens. A truly blissful afternoon, and I can’t wait to do it again!